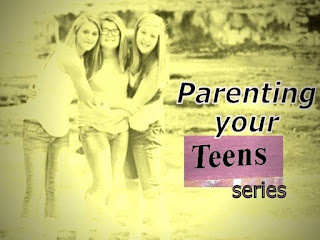 It’s time for another post of simple arts and crafts projects that my kids made (sometimes with my help). The first one is just a very simple way of decorating Janel’s portfolio/folder. We used glittered foam sheets. 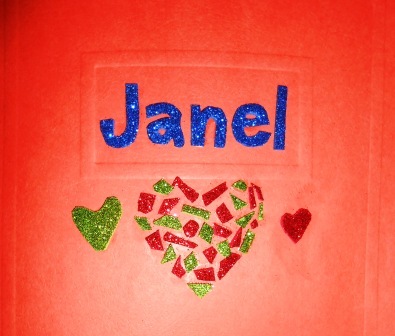 I cut out the letters of her name and Janel cutout the red and green hearts. Then the scraps were cut into tiny pieces and glued to the surface so as to make one big shape of a heart. The second one is Kristel’s art project called Mystery Tree of Texture – a collage, in my opinion. The instructions for this is in their MAPE book. What she did was cut 8 strips of newspaper, twisted each one and twisted them together at one end. This is going to be the tree trunk and branches, which is glued onto a white paper and allowed to dry. Then, different pictures from magazines were collected and pasted onto the end of each branch. It would also be good to use different objects of different texture so that this can be more aptly called mystery tree of texture. The last part of the project is to cut out leaves from art paper, or perhaps real leaves can be used and glued to the different parts of the branches. The branches were colored brown, too. The third project is Angel’s, the Kindergartner. 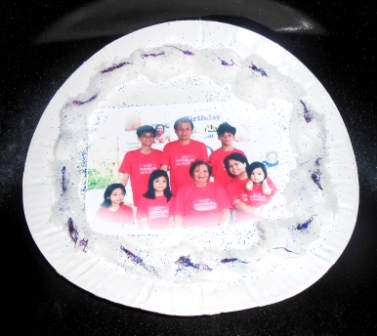 The materials she needed to make this simple paper plate photo frame include paper plate, cotton, glue, glitter and family picture. The first step is to glue the picture at the center of the paper plate. The next step is to glue some cotton around the picture. Then, scatter glitters on the cotton. Extra decors may be added also such as adding ribbons or buttons or stickers. The fourth project is a lesson on rhythmic drawing. With rhythmic drawing, what is required is the use of repetition or alternation of the drawn elements (i.e. circles, lines, dots, etc). Kristel chose to draw a butterfly. To make sure that rhythmic patterns are made the drawing paper was folded in half. The drawing is done along the folded side and only one-half of the object is drawn. Then, she unfolded the paper and traced the marked lines on the other side of the paper. The last part is the coloring of the drawn object. She used oil pastel. It does look pretty. 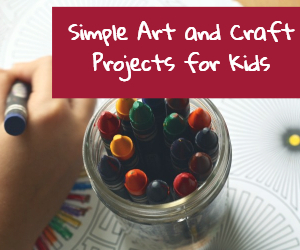 I hope these projects will give you some ideas on your next projects with your kids. Those are pretty DIYs. I sometimes do some kiddie arts and crafts too especially when incredibly stressed. This is such a great art, my kids are into crafts and what not, this is so perfect for them. Also, great opportunity to spend time together and explore their creativity. Nice idea on that butterfly rhythmic drawing. Folding it makes the output symmetrical.